By Bogna Haponiuk and Jakub Janus - PhD. How to calculate CBM when your package is irregularly shaped? Why the CBM calculation for sea shipment matters? This CBM calculator for shipping is a simple tool that helps you determine the volume and weight of your consignment. This helps you plan your transport: all you have to do is input the dimensions and weight of the cube you're shipping, and our calculator will tell you how many cartons of this size will fit in a standard container. You will also learn more about the CBM measurement and cubic meter itself. You can use our calculator straight away, or read on to learn how to calculate CBM. Once you're done, make sure to check out the freight class calculator, too! Don't worry about recalculating the units, though. You can easily change them in the container volume calculator. Centimeters, inches, or feet? They're all there. You may also compare various measures of volume, both metric and imperial, using our volume conversion calculator. Make sure that all of these values are in the same units! When in doubt, use our length conversion calculator. If you decide to input the weight of a single carton, our CBM calculator for shipping will automatically return two additional values: the total weight and volumetric weight of your cargo. What is the difference between the two? Total weight describes how much your cargo weighs. You can obtain this value by multiplying the weight of a single box by the quantity of cartons in a consignment. Volumetric weight, on the other hand, is an artificial measure of how much space the shipped item occupies. Imagine the following situation: you are traveling on a plane, and take incredibly light luggage with you. In that case, you will be charged not for the weight, but rather for the volume of the item. If you just need to check dimensions of the surface area, take a look at our square footage calculator. When estimating the shipment cost, many companies choose either total or volumetric weight, depending on which one is higher. This is called the Weight or Measurement Rule (W/M rule). Both FedEx and UPS apply this pricing technique. Items of low density will typically be charged per kilogram of volumetric weight. Specific rates may, however, depend on freight carriers, origins, or destinations. Also known as dimensional weight, volumetric weight typically favors shippers of heavy, dense goods, and makes it more costly to dispatch lightweight but sizable packages. Determine the dimensions of one shipping cube in your consignment. Let's assume it's 50 cm long, 80 cm wide, and 60 cm high. Weigh one carton. Let's say it weighs 35 kg. Decide on how many boxes you want to ship. For example, your shipment can consist of 20 boxes of identical shape and weight. The total weight is lower than the volumetric weight, so you can expect to be charged according to the latter. Finally, choose the type of a container you'd like to ship your cargo in - for example, a 40′ Standard Dry Container. Our CBM calculator for shipping will automatically tell you how many boxes of such dimensions you can fit in it - in this case, 277. Please note that the maximum number of cartons that fit in a chosen container is just an approximation. It is possible that due to the arrangement of packages in the container, some space will be left unusable, what will decrease the total number of boxes that fit into it. Dry containers 20' and 40' (general purpose) are sufficient for a broad class of cargo. Usually made of steel or aluminum, they have exactly the same width and hight, and differ only in length. These are, by a significant margin, the most common types of container. Around one foot taller, high cube dry containers are considered to be a bit more suitable for voluminous but light articles. Both of these types of containers are multi-modal. This means that they can be transited by ship, train, barge, and truck. Consequently, they allow for door-to-door transportation solutions. When it comes to standard, rectangular packages, getting the right CBM measurement is not that hard, and incredibly simple with our shipping container volume calculator. However, if your package is irregularly shaped, you need to be sure that it does not exceed the limit of the box in any dimension. Imagine, for example, that you would like to ship a really long but narrow consignment. To solve this problem, you must identify the longest, widest, and tallest parts of your shipment. In other words, you need to figure out the dimensions of the smallest cuboid that your package can fit into. If you're interested in calculating volume of other geometric shapes, take a look at our cylinder volume calculator which returns the volume of right and oblique circular cylinders. The volume of the most common three-dimensional solids may be estimated with this volume calculator. CBM calculator may be a useful tool when shipping freight via sea. As a matter of fact, most of the ideas in the cargo shipping industry come from maritime freight, and only later entered air or rail transport. Maritime transport remains the cheapest and the most important form of cargo. The efficiency of this form of transform has been achieved mostly by containerization. Starting from the mid-twentieth century the containers have standardized dimensions. Cargo containers enable automation. Goods don't need to be handled manually anymore. Once containers are delivered to a port, they may be loaded onto trucks or trains, and then be shipped to various locations. The effects of standardized shipping containers on the economy went far beyond the cargo industry. Since the 1990s they have transformed entire economies, which were not held back by large expenses of ocean-going freight. In the modern economic system, where each country can be connected to global value chains, both as a supplier or a consumer, it is the cargo shipping rules that level the playing field, and cement the terms of exchange. You can learn about the determinants of maritime transport costs in the recent years from this great report by United Nations Conference on Trade and Development. As of 2013, 90% of international trade is seaborne, and shipped in 700 million containers. More and more of them are equipped with remote tracking systems, and are easy to navigate with computerized logistics systems. Bogna Haponiuk and Jakub Janus - PhD. 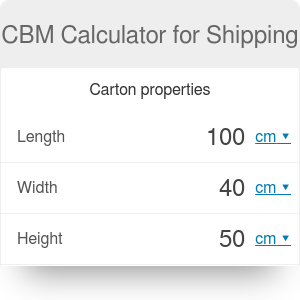 CBM Calculator for Shipping can be embedded on your website to enrich the content you wrote and make it easier for your visitors to understand your message.